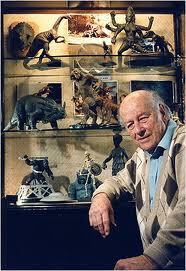 Movies At Dog Farm : Ray Harryhausen 1920-2013 R.I.P. I cried when I read the news at work today, and I'm misting up again as I write this. It's heartbreaking to see your heroes pass on. Thank you so much, Mr. Harryhausen. The world is an immeasurably richer place thanks to the gifts that you shared.